Description: Help protect local waters by fighting the spread of aquatic invaders. Show your support with a Be a Hero–Transport ZeroTM floating keychain. Description: Help protect local waters by fighting the spread of aquatic invaders. Show your support by using this neoprene beverage sleeve. Description: This 24 x 30 inch aluminum boat ramp sign reminds Illinois boaters to take simple steps before and after leaving a water access to prevent aquatic invasive species like silver carp, zebra mussels, and the fish disease VHS from harming lakes and rivers. Description: This 12 x 24 inch aluminum boat ramp sign reminds Indiana boaters to take simple steps before and after leaving a water access to prevent aquatic invasive species like silver carp, zebra mussels, and the fish disease VHS from harming lakes and rivers. Description: Help protect local waters through the Be a Hero–Transport ZeroTM campaign. Post this 24 x 18 inch aluminum sign at boat ramps or water access points to remind water users to do their part in preventing the spread of aquatic invaders. Description: Retailers! Help protect our natural areas with this 10 x 26 inch poster. Display it to remind aquarium and water garden customers to never release plants or animals. Description: Help protect local waters with this 11 x 17 poster. 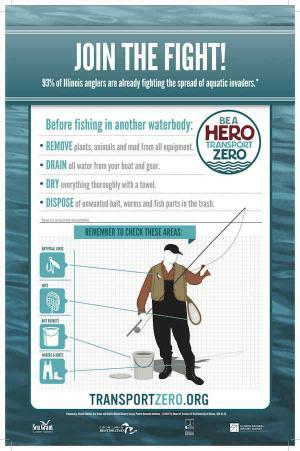 Display this poster to remind wading anglers of simple steps they can take to prevent the spread of aquatic invaders. Description: Help protect local waters with this 11 x 17 poster. 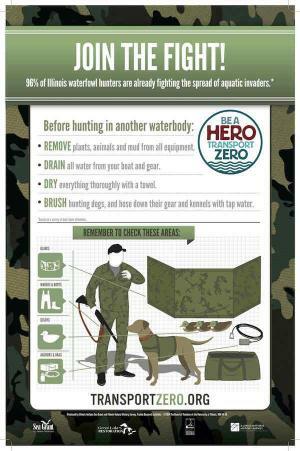 Display this poster to remind waterfowl hunters of simple steps they can take to prevent the spread of aquatic invaders. Description: Retailers! Help protect our natural areas. Hang this 10 x 26 inch poster to educate employees and customers on the importance of choosing non-invasive organism for water gardens. Description: This 11 x 17 inch cling poster was created with bait shops in mind. It can cling and uncling to many surfaces including walls and tanks. It reminds anglers not to dump their bait and includes specific steps to properly dispose of their bait. Description: Help protect local waters with this 3" x 5" sticker. Place it on your winch post and gear as a reminder of simple steps you can take to reduce the spread of aquatic invasive species. Description: Anglers! Grab this 3 x 5 inch sticker to stick to your bait bucket as a reminder to not release your bait into local waters. Description: Boaters and anglers can help prevent the spread of aquatic invasive species to new lakes and streams. This 3 x 5 inch sticker can be attached to bait buckets or winch posts to remind you what specific steps to take to protect our waters. Description: What's in your water garden? Many plants used in aquariums are invasive if they make their way into the environment. This wallet-sized card includes lists of potential invader to avoid buying and non-invasive plants that are a better choice.